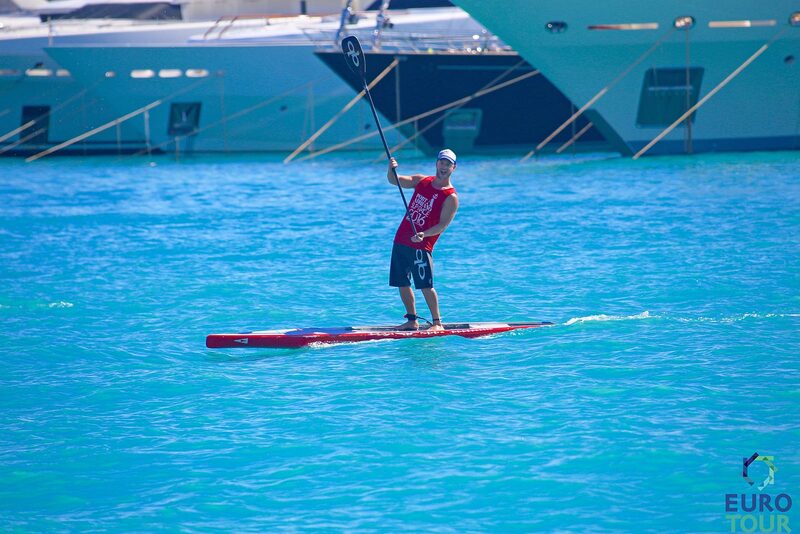 Paolo Marconi (Italy/RRD) and Sonni Hönscheid (Germany/SIC) have claimed impressive victories against a strong regional field here at the Port Adriano SUP Race on the beautiful Mediterranean island of Mallorca, Week 2 of The Euro Tour presented by Starboard. Paolo announced himself as one of Europe’s genuine contenders, leading home a clean sweep of the podium for Team Italy at the 4th annual edition of this great race. Meanwhile Sonni was in a league of her own, and showed she’ll be hard to stop as she chases back-to-back EuroTour crowns. Port Adriano 2016 turned into a wild and woolly ocean race, as leftover swells from a week of high winds bounced off the imposing cliffs to create a washing machine effect that definitely tested competitors (though despite the rough conditions at ocean level, it was actually a beautiful sunny day). There were definitely a few downwind bumps to be found, however there were also bumps from every direction to contend with. Some of the paddlers commented post-race that it was a really fun challenge (yours truly included – I had a ball out there, even if I was at the back of the field), while others had a day they’d probably rather forget. 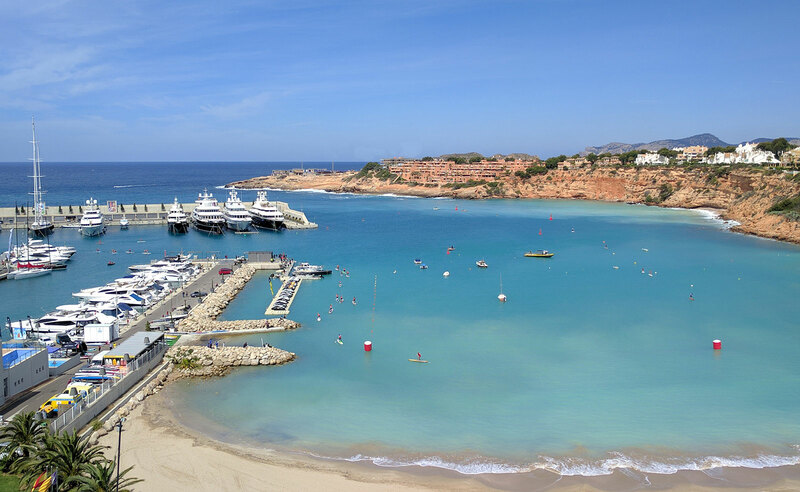 The race started inside the protected harbour of Port Adriano, alongside a rather impressive lineup of $50 million dollar megayachts, before venturing out into the open ocean. The field scattered as soon as we left the port, with Paolo making a move around the 3km mark to quickly open up a big gap on the other top guys. The Italian Stallion remained roughly a minute ahead all the way home to salute in a time of 55 minutes, and in doing so announced himself as a genuine contender on the European stage this summer. I chatted with Paolo after the race and he spoke about how hard he’d been training over the winter – hard work that has clearly paid off for the RRD team rider. Paolo’s heroics laid the foundations for a clean sweep of the men’s podium by Team Italy, with the unheralded Giordano Bruno Capparela (BIC) in second and dark horse Davide Codotto (3 BAY) in third. Team France has long been the powerhouse of European paddling, however Team Italy has definitely established itself as the top contender to the throne and is closing the gap on the Frenchies. Speaking of France, it was an impressive top five double from the Teulade Brothers, Jeremy and Ludovic of Team Starboard, while Pepe Oltra (SIC) was the top placed Spaniard in 6th, just a few seconds ahead of yet another Italian in Martino Rogai (Jimmy Lewis). Branislav Sramek (JP), Roman Frejo (Starboard) and Peter Bartl (JP) rounded out the top 10. In the women’s it was OluKai and Molokai champion Sonni Hönscheid all the way, with the powerful German feeling right at home in today’s bouncy ocean conditions. The SIC team rider, who is the reigning EuroTour champion, was so strong she almost snuck inside the men’s top 10, finishing in 1:01:15. Today’s runner-up was yet another European name to watch, Susak Molinero, who hails from Spain but lives and trains in Italy with her boyfriend and RRD team mate – race winner Paolo. Susak crossed the line in 1:04:58, one minute ahead of local hero Laura Quetglas (SIC), and two and a half minutes clear of fourth placed Susanne Lier from Team NSP. Even with the wild conditions, it was a great day here on the incredible island of Mallorca (or “Majorca” for the layman). SUP Racer has been camped out here the past three weeks, and I would gladly stay here the entire summer. Big thanks to Port Adriano for hosting us, and to Mar Balear SUP Club for organising the race. 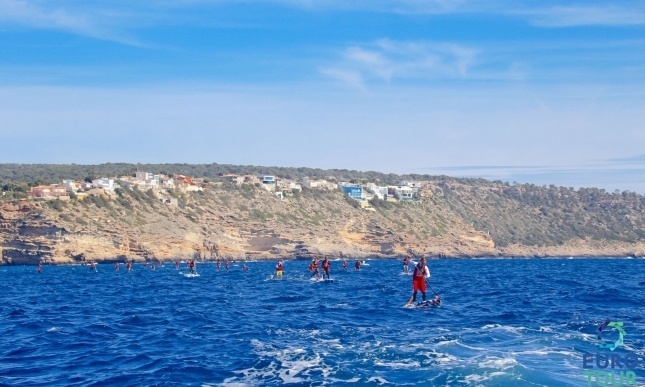 Mar Balear is home to the largest kids training squad in Europe, and it was great to see the “niños y niñas” (boys and girls) racing with so much enthusiasm out on the junior course, before sitting on the docks and cheering on the elite competitors at the start and end of the race. There are some seriously talented kids on this island, while the whole Mar Balear Club and all the parents and volunteers, and the Port Adriano SUP Race by extension, have the singular focus of giving the kids an opportunity to train, compete and just have fun on the water in general. 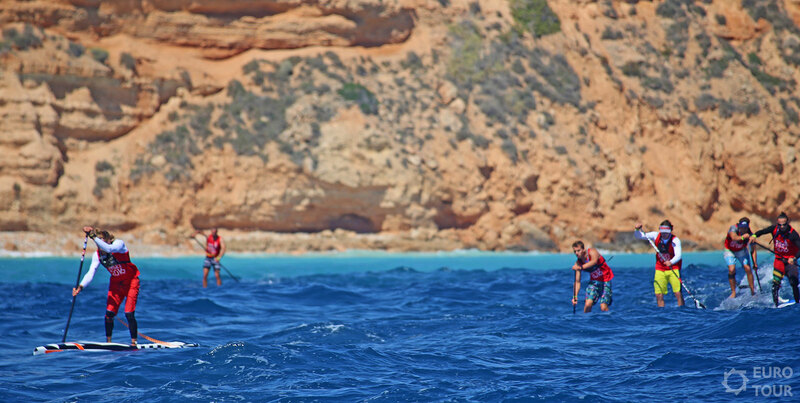 They’ve really got a great thing going here on Mallorca — kinda reminds you why this paddling community of ours is so great. The fastest of the local lads was potential star of the future “Quique” Senra took out the U-18 division despite being just 14 years old, while Cyara Valenzuela claimed the win in the junior girls race. There will be more kids races tomorrow, with the Red Paddle Co 10’6 inflatable showdown (as well as the awesome “Big SUP” knockout race). Tomorrow also sees the Port Adriano outrigger race, which I’m personally looking forward to — never done an OC-1 race though, so hopefully it’s a little calmer out there in the morning! 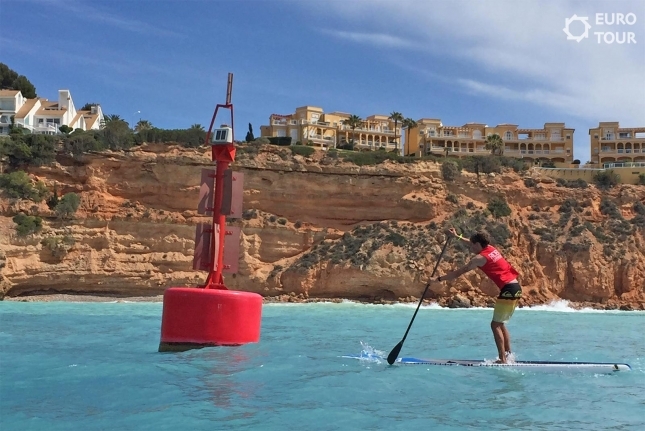 The EuroTour continues into Week 3 next weekend with the classic SUP Race Cup in St. Maxime, France, before the big Lost Mills race in Germany and the Bilbao Paddle Challenge after that. Those three events will be the “Headliners” of the EuroTour, with around two dozen top ranked international athletes about to start making their way to France to begin their European campaigns. Though judging from the performances today, they’ll have their work cut out for them against the dark horses of Euro land.